2017 Tokyo Yushun (Japanese Derby, G1) winner and second favorite Rey de Oro dominated this year’s Tenno Sho (Autumn) scoring his second G1 win in a tough competition which included six other G1 winners. After claiming all three of his two-year-old starts including the Hopeful Stakes (G2), the King Kamehameha colt commenced his three-year-old campaign with a fifth in the Satsuki Sho (Japanese 2000 Guineas, G1) then claimed the Tokyo Yushun (Japanese Derby, G1). He landed another graded win in the Kobe Shimbun Hai (G2) and capped off the season with a runner-up effort in the Japan Cup (G1). This year, following a third in the Kyoto Kinen (G2) and a fourth in his overseas challenge, the Dubai Sheema Classic (G1), the colt was refreshed after given a six-month break and claimed the All Comers (G2) in September. Trainer Kazuo Fujisawa’s most recent G1 win was with the colt in last year’s Tokyo Yushun and he now celebrates 27 JRA-G1 career wins. This is his sixth Tenno Sho (Autumn) triumph while the others were with; Bubble Gum Fellow (1996), Symboli Kris S (2002 and 2003), Zenno Rob Roy (2004) and Spielberg (2014). For Jockey Christophe Lemaire, this was his 20th JRA- G1 victory and third consecutive weekend to score a G1 win following the Shuka Sho with Almond Eye and the Tenno Sho (Autumn) with Fierement. 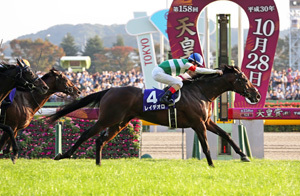 This was his second three-week G1 winning streak, a feat he also accomplished last year (Victoria Mile, Yushun Himba [Japanese Oaks], Tokyo Yushun) while the only other jockey to do so was Olivier Peslier in 2001 (Mile Championship, Japan Cup, Hanshin juvenile Fillies). The race got underway with sixth favorite Kiseki leading the field, Al Ain and Vivlos chasing the pace and Rey de Oro reserved in sixth. Shifting to an outer route after the last turn in fifth, Rey de Oro unleashed a strong turn of foot, picked off all runners in front of him but one by the furlong marker and finally took over the lead from the stubborn pace setter 100 meters out to clear the wire a 1-1/4-length winner. “I knew I had a good chance to win the Tenno Sho title for the first time. The colt’s condition and the race development were perfect. The pace was just right and the colt was relaxed so everything went smoothly. He showed good long-lasting speed. I’m grateful to be given great rides and am happy to be doing this well (tied with the most annual G1 wins (six)),” commented Christophe Lemaire. Fourth favorite Sungrazer cruised two lengths behind Rey de Oro in mid-field, furiously chased the eventual winner down the straight while displaying the fastest last three-furlong drive, dug in gamely and poked his nose in front of Kiseki at the wire, stealing the runner-up seat. Race favorite Suave Richard had to travel near the rear from being bumped heavily after the break and never reached contention, finishing 10th. H. Asami G1 Racing Co., Ltd.
“The Emperor’s Cup” was first held in 1905 to encourage the horse racing sport through annual events that gave the winner the highest honor of being awarded the Imperial prize. Then the Tenno Sho (Autumn) was established in 1937 together with its counterpart, Tenno Sho (Spring), under the name “Teishitsu Goshoten Kyoso” and held biannually in both the Eastern and Western part of Japan. The race was officially renamed the “Tenno Sho” in 1947. Both the spring and autumn races, which secured its status as the most prestigious events for older horses, were run over 3,200 meters in the early years. Later, the autumn version was shortened to 2,000 meters in 1984 so that the spring version could determine the best stayer, while the Tenno Sho (Autumn) would be the main target for middle-distance champions. This also gives the three-year-olds, who find the third leg of the Triple Crown, the Kikuka Sho (Japanese St. Leger, G1, 3,000m), to be beyond their suitability, an alternative G1 as the ultimate goal for their autumn campaign. The Tenno Sho (Autumn) entered a new chapter in its long history when opening its doors to foreign contenders as an international race in 2005. Last year, Kitasan Black (JPN, by Black Tide) became the fifth horse in JRA history to capture both the spring and autumn Tenno Sho in the same year, and the second to score three Tenno Sho titles overall. Among the thirteen runners in this year’s version were Sungrazer and 2016 Tokyo Yushun (Japanese Derby, G1, 2,400m) winner Makahiki, coming off their first and second place finishes, respectively, in the Sapporo Kinen (G2, 2,000m; Aug.19). 2017 Derby winner Rey de Oro had claimed the All Comers (G2, 2,200m; Sep.23) in which 2017 Satsuki Sho (Japanese 2000 Guineas, G1, 2,000m) winner Al Ain finished a neck behind in second. While this was the autumn kick off for Osaka Hai (G1, 2,000m; Apr.1) winner Suave Richard, Takarazuka Kinen (G1, 2,200m; Jun.24) victor Mikki Rocket and 2017 Dubai Turf (G1, 1,800m) champion Vivlos, it was the second fall start for 2017 Kikuka Sho victor Kiseki who scored a third in the Mainichi Okan (G2, 1,800m) three weeks earlier. 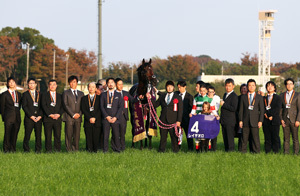 The race record 1:56.1 was set by Tosen Jordan (JPN, by Jungle Pocket) in 2011.